Viv Comes for a visit and wants to take Lucy up on her suggestion. 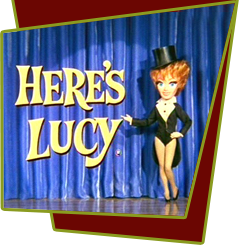 It seems Lucy told Viv that if she ever comes to LA, Lucy will get her a date with her "good friend" Lawrence Welk. Lucy doesn't want to let Viv know that she was fibbing, so she gets Mary Jane to bring in a Lawrence Welk wax figure, and maybe if she takes Viv's glasses away, Viv won't be able to tell the difference. Meanwhile Kim and Craig manage to get the real Lawrence Welk to pay a visit, causing a wonderful sensation in the household! Special Notes: This story line is very reminiscent to I Love Lucy, episode #125, "Harpo Marx". This time it is Viv and not Caroline who can't see without her glasses. Bloopers: Desi Arnaz, Sr's laughter can be heard in the studio audience.